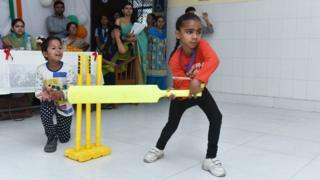 Hundreds of thousands of pupils in schools across India are getting lessons in the art of cricket. But for a country which counts the sport as a national passion, these classes are not about finding another cricket superstar such as Virat Kohli. Instead the aim is to challenge gender stereotypes and promote equality between the sexes. Sumita Kumari, a teacher at Jawahar Navodya Vidyalaya school in Dakshin Dinajpur, West Bengal says around 80% of India's population is from rural areas, where many children are likely to face "certain notions about gender roles". "In a rural environment, a big division can be seen in the development of the two genders. "Firstly, there is restriction on the freedom of girls. Secondly, there is a clear division of work between boys and girls," she says. Boys might be expected to work outdoors while girls are "kept busy in household chores". "If a girl wants to participate in sports like swimming, playing soccer or cricket, they become victims of gender inequality. "Likewise, if a boy is interested in cooking or wants to dance then society frowns on him. They face ridicule and non-cooperation from society." The Changing Moves Changing Minds project, run by the British Council, hopes to tackle some of these attitudes through cricket and dance. "Sport is such a universal language," says Alan Gemmell, director of the British Council in India. "It is about teamwork, it is about coming together, and cricket is such a powerful connecter across India." Children taking part in the scheme will get a series of lessons in dance and cricket skills - such as choreography and movement and batting and bowling. "Some of the lessons are about choreography and playing games," Mr Gemmell explains. "It's about challenging stereotypes and saying there aren't just things that boys do and things that girls do - and that's part of what the dance element does." The classes will be followed by activities that "give teachers confidence to continue to promote positive gender roles for boys and girls". "We hope that that's a very small thing to do that might shift behaviour or make people think differently about paths that they might take, choices that they might make as they grow up," he says. Ms Kumari was among a group of teachers who took part in a pilot of the scheme, which was delivered by the British Council in partnership with the Marylebone Cricket Club and the Royal Academy of Dance. During the project, she taught children a new dance that combined cricketing actions with Indian dance steps. There was resistance at first. She says the children felt "very uncomfortable", with one boy saying: "How do we dance with girls?" Another argued that "Playing cricket with girls is absolutely impossible". Meanwhile, the girls told her "We do not even know how to hold the bat and we will not be able to play cricket." "I did considerable counselling and motivated the children and I also talked to their parents," Ms Kumari says. "After that, girls felt encouraged to play cricket and boys started to dance." "The children started opening up to me and started sharing their problems," she adds. The scheme is now being rolled out to schools across India, with 300,000 youngsters expected to take part in lessons given by teachers who have been given specialist training over the next three years. Mr Gemmell says: "What we're trying to do with the programme is harness this incredible power of sport to promote positive role models and to have boys and girls take part in activities together in schools across India." He says the aim is to use "sport and arts, cricket and dance and movement to get boys and girls to play together" and then use that as a platform for teachers to begin conversations about gender roles. Ms Kumari's school provides free education, with children from rural areas given priority. She believes the British Council scheme has helped to promote equality. "Boys and girls who come from poor rural families in our school, some of whom are first generation learners were given the opportunity to be introduced to a project that helped them challenge their thinking around gender inequality and they learned and presented a new dance style in a very beautiful way without any hesitation," she says.